On 27th December the President of Azerbaijan Ilham Aliyev approved by Decree a new five-year State Program on Road Safety. The ‘State Program of Azerbaijan Republic on Road Safety 2019-2023’ includes measures to improve road safety and reduce the number of road traffic crashes in Azerbaijan thereby also reducing the socio-economic damage caused by preventable road casualties in the country. The Program was developed while taking into consideration the requirements of international legal acts in which the Azerbaijan Republic stands for, as well as other existing legal acts of the Azerbaijan Republic. The passing of the Decree has been a historic milestone for the country in terms of road safety. State actors, civil society and the private sector have all expressed their enthusiasm for the multi-sectorial Program and it’s potential for making considerable long-term changes for safer roads for all. 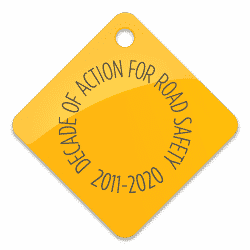 EASST partner, the National Automobile Club of Azerbaijan (AMAK) was the first (and is still one of very few) civil society organisations working on road safety in the country. It is well recognised by government institutions, as well as private sector organisations, as dealing with road safety issues effectively and systematically, and has been actively advocating for the Program’s development and approval by bringing stakeholders together and bringing up the importance of road safety to the government’s agenda. Since 2009 AMAK has been implementing road safety education and awareness campaigns, and promoting a road safety culture in the country. AMAK is currently developing strategic advocacy programs related to policy on road safety education, the use of child restraint systems, and promoting accessible mobility for people with disabilities – working in close cooperation with key government agencies including the Cabinet of Ministers, the State Road Police, and Ministry of Transport. AMAK is now ready and willing to be part of the State Program’s implementation to maximize the outputs of these reforms through evidence-based initiatives and supporting educational and legal enforcement efforts by local government agencies.